Finally a VDR pricing structure that makes sense. FirmRoom's flat-rate pricing is transparent, so you always know what to expect. 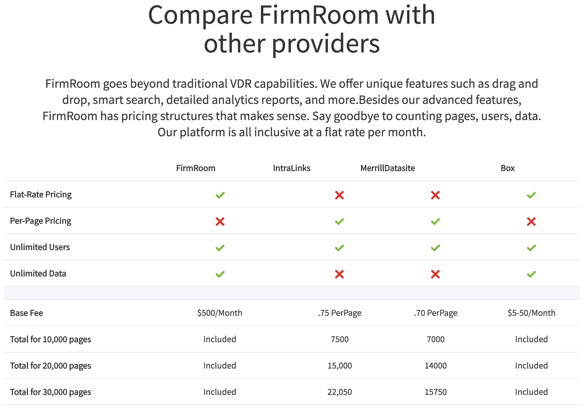 Why is FirmRoom the fastest growing data room provider? FirmRoom was designed with our customers in mind. We’ve heard it before, “All data rooms are the same.” And we wanted to change that stereotype. We set out to fix the common issues with VDRs, and to be different. "FirmRoom is a convenient and intuitive platform that saves both time and money. It's faster than any other VDR platform I've used." Customers enjoy using our platform because it is user friendly, has a clean interface, and it helps close deals faster.